The Croatian cuisine is specific for every region, reflecting the country's geography, history, and culture. A single type of Croatian cuisine does not exist, because each Croatian region has its own, unique cuisine. The northern and southern areas of the Adriatic are characterized by differences in taste and preparation of more Mediterranean foods. The tradition of grilling and roasting fish and delicacies of the sea has been carried down by generations. In the north of Croatia however, Austro-Hungarian culinary influences are more evident. Not to be forgotten is the wine, known for its special taste of the warm south. The choices among the specialties are endless! Where to go eating? Beside the hotels, who offer stay and include half- or full board, in all cities, tourist places and next to the main roads are located restaurants, guesthouses, taverns, konobas (typical croatian guesthouses), pizzerias and fast food restaurants, though for the gourmand the most interesting are the restaurants and guesthouses with the domestic croatian kitchen. Except of the standard european kitchen, Croatia offers own most popular domestic dishes and specialties: of the cold plates these are for example the famous dalmatian or istrian prosciutto, cheese from Pag or Lika, sheep cheese, kulen from Slavonia, cesnjovke from Samobor or Zagori and fresh cheese with cream. The main dishes depend on the area in which you are situated. In Dalmatia and the coastal areas, on the islands and in Istria the main dishes consists mostly of fish and sea fruits and of meat, pasticada or cooked lamb. The cultivation of grapevines and the production of drinkable and elected wines is for centuries a tradition of the croatian winegrowers, in the continental part of Croatia, as well as in the coastal areas and in Dalmatia. Well-known kind of croatian wines along the Adriatic coast and on the islands are from the red wines: teran,merlot, kabernet, opolo, plavac, dingac and postup, and from the white ones: malvazija, posip, pinot, kujundzusa, zlahtina and muskat. From the continental part are known the wines rizling, grasevina, burgundac and traminac. From the spirits are of course known the brandies: sljivovica (prunes), travarica (herbs) and lozovaca, and of the desert drinks prosek and maraschino. 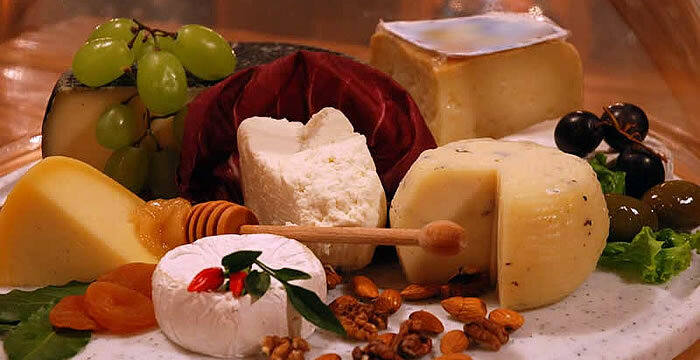 Selection of cheeses and cold dishes of Istria are specialties. The cuisine of Istria and the Kvarner regions represents a special Croatian style of cooking, a blend of inland and coastal. These regions are rich in excellent fish and seafood, most notable among them being found in the northern Adriatic: scampi (prawns), calamari and shellfish from the Limski Kanal (Fiord). After an excellent prosciutto, and cheese and olives, many traditional wine cellars offer fish soup, fish stew, boiled prawns, black and white frutti di mare risotto, as well as other dishes typical of the central part of the Istrian peninsula - traditional wine soup, ragout (jota) similar to Italian minestrone (manistra, menestra or manestra), and also pasta and risotto dishes cooked with the famous truffles of the region - a self-sown precious mushroom species, unearthed by specially trained dogs and pigs; these fungi have the reputation of containing aphrodisiac properties. The excellent Istrian wines include Malvazija of Buje, Cabernet of Porec, Sauvignon and Merlot, as well as Teran of Buzet, Zlahtina of Vrbnik, and sparkling wines - Bakarska Vodica, etc. Fine restaurants abound in Istria and Kvarner, especially on the Opatija, Crikvenica, Rovinj and Porec littorals, as well as in the interior and on the islands. The cuisine of Dalmatia and the islands follows the trend of modern nutritional norms. The brief thermal preparation of foodstuffs (mainly boiling or grilling) and plenty of fish, olive oil, vegetables and self-sown herbs found near the sea is why this cuisine is considered to be very healthy. Dalmatian wines, like olive oil and salted olives, have been highly esteemed since ancient times, which the present names of some of the indigenous grape sorts reveal (Grk : Greek, from the island of Korcula; Prc from the island of Hvar). Famous wines include Dingac and Postup from the Peljesac Peninsula; Babic from Primosten; Vugava and Plancic from the island of Hvar... then there are Posip and Grk from Korcula; Marastina from the island of Lastovo; Malmsey (Malvazija) from Dubrovnik, etc., and also Prosecco (a sweet dessert wine), the very strong grape (loza) and herbal brandies (travarica, grapes with medicinal herbs) and liqueurs (Maraschino, Vlahov). Although even today every area has its own way of preparing certain dishes, the cuisine of the islands represents a separate world, their distinguishing features having been discovered only recently, such as the cuisine of the islands of Hvar, Korcula, Brac (vitalac, a dish made from lamb offal wrapped in lamb gut and spike-roasted), Vis (spike-roasted pilchards, as during the Ancient Greek period; flat cake with pilchards from Komiza and Vis, related to the modern-day pizza). Fresh sea fish (dog's tooth, gilthead, sea-bass, grouper, mackerel, pilchards) grilled, boiled or marinated; then there are molluscs (squid, cuttlefish, octopus), crustaceans (shrimps, lobsters) and shellfish (mussels, oysters, date-shells) boiled in a fish stew or as a risotto. Of the meat dishes, prosciutto is unarguably unrivalled - pork leg smoked and dried in the bora (from Drnis), served with dry, mostly sheep’s cheese (famous sorts of cheese are those from Pag and Dubrovnik) and salted green and black olives, capers and pickled onions. Lamb is also very highly valued, especially boiled or baked on an open fire (Franjevacka begovica from Visovac, or lopiz from the island of Iz); also, dried mutton (kastradina), roast beef, Dalmatian stew (pasticada) with gnocchi, offered by many restaurants. Lightly boiled vegetables are also favourite dishes (Swiss chard with potatoes, tomato sauce) often a mixture of cultivated and self-sown vegetables, spiced with olive oil and wine vinegar, or served with meat (manestra - pasta with minced meat; Aramaic - stuffed vine leaves). Regions with an abundance of fresh water are famous for their frog, eel and river crab dishes (the Neretva valley, Trilj and the Cetina basin). Typical Dalmatian desserts win the heart with their simplicity. The most usual ingredients include Mediterranean fruit, dried figs and raisins, almonds, honey, eggs (rafioli, mandulat, smokvenjak, the gingerbread biscuits from the island of Hvar - rozata). The cuisine of Gorski Kotar and Lika reflects living conditions in the forested highlands and pastures, where summers are short and winters long, which limits the availability of foodstuffs. It is recognized by its simplicity (open-fire cooking and baking), as is the case with regions closer to the sea (Dalmatinska Zagora and central Istria), but everyday meals include predominantly continental products - pura (or palenta) - boiled maize, boiled potatoes, or potato halves baked in their skin, pickled cabbage, broad-beans and runner beans, cow’s and sheep’s milk and delicious cheeses (fermented cheese known as basa, and dried cheese), meat, fresh and smoked lamb, mutton and pork, as well as venison. These regions are also rich in mushrooms and self-sown herbs, but there are also delicious, strong plum brandies and brandies made from forest fruits, or mixed with honey. The cuisine of Lika is found in the region of the Plitvice Lakes, and fine homemade cheese can be bought from roadside stalls when driving through Lika. The cuisine of northwest Croatia is characterized by many simple, delicious dishes. Bread is mostly made from maize, barley, or a mixture of the two, and cakes are often similar in texture to bread (kukuruznjaca - made from maize; periaca, zelevanka, buhtli, doughnuts, walnut and poppy-seed loaves). A profusion of pasta dishes, dairy products (made mostly from cow’s milk), as well as plenty of vegetables (beans, potatoes, cabbage, etc. ), often mixed with meat to form a broth (zucchini, cucumbers, runner beans, broad beans, peas in the summer, and beans with pickled cabbage in winter, beans with barley porridge) and salads (fresh cucumbers with sour cream and garlic, lettuce, tomato salad, peppers and onions). This is where food provision for the winter is still made in the traditional manner (pickled cabbage, cucumbers boiled in vinegar, pickled peppers, red beet, as well as sweet dishes - plum jam, rosehip jam, bottled fruit, etc.). In the same way that southern cuisine differs from island to island, so does the cuisine in this part of the country differ from one region to the next. In the region of Medjimurje one really must sample buckwheat porridge with meat from fat meat or blood-sausages, as well as side dishes of baked beans or potatoes, formed in cones, with rich spices, or smoked or dried cow’s cheese turas, known in the region of Podravina as prge. Turkey with mlinci (a boiled pasta dish), strudels of various kinds, as well as pumpkin cake with poppy seeds, have spread from the region of Zagorje throughout Croatia. It is hard to find more delicious geese and ducks than those from the region of Turopolje, or baked carp (krapec na procep) than those from the regions of Moslavina and Posavina. The region of Banovina became famous for its winter salami (Gavrilovic salami). blood-sausages, garlic-sausages and other special sausages, for baking with pickled cabbage, boiled smoked pork leg with potato or bean salad with onion, are favourite dishes almost everywhere. Samobor, a small town near Zagreb, is an ideal venue for a gastronomic excursion. Its picturesque restaurants offer Samobor Steak, Samobor custard slices, salami and kotlovina - port and potato stew - hermet (sweet, spicy wine) and mustards which have been prepared here for almost two hundred years. The cuisine of Varazdin, and in particular of Zagreb, represents urban, metropolitan cuisine, related to the more famous cuisine of Venice. Of course, Zagreb has also its steak (bread-crumbed veal stuffed with cheese), and it also offers a variety of roast dishes (beef, pork and fowl) served with potatoes, vegetables and horseradish, as well as various stews (wine goulash, bacon and tripe, lungs "sour art"), grilled meat, pasta… Delicious sweets continue a tradition hundreds of years old – a tradition of the "baking woman of Gric" and bishops’ pastry-cooks, revealing Croatian dessert cuisine in its entirety (Croatian pancakes, Zagorje strudel, strudel stuffed with cottage cheese, or apple strudel, bucanica, various cakes, ice-creams). Zagreb’s contemporary cuisine is international, with the finest Italian cuisine widely represented. Restaurants frequently offer better quality fish than those available on the coast, more delicious lamb than in the region of Lika, and better kulen than in Slavonia. One should savour the following wines from this region: Portugizac from Plesivica and Jastrebarsko, Rhine Riesling, Chardonnay from Strigovan, Muscat Otonel, Turk's sparkling wines, as well as wines from the wine-cellars in Bozjakovina, Pinot Blanc from Sveti Ivan Zelina, Moslovina Skrlet from Voloder, as well as many other wines, but also the traditional drink, gvirc (gvirc, mead) sipped with gingerbread biscuits. Slav Rich and fertile Slavonia and Baranja comprise the bread basket of Croatia, and so white bread, flat cakes and many other cakes filled with walnuts, with poppy seeds or plum jam, have been baked here since ancient times, made from the most representative pastry made from green wheat. Pasta, potato, beans, dairy dishes and fat meat dishes (cottage cheese with sour cream, dried cheese) and fattened fowl and pork dishes are also prepared here. Such types of food were once cooked to provide the energy required for heavy work, although these days their preparation is considered too time consuming, and requiring too much effort. In these regions hot goulash (beef, venison), regos (several meats with pasta), fish paprika-flavoured stew (with various fish: carp, pike, sheat-fish, etc.) are typical. Smoked and dried pork ham, sausages, as well as kulen are also firm favourites, especially when served as a delicacy with cottage cheese, peppers, tomatoes and green onions or pickled vegetables (tursija). The plum brandy made in this region is very smooth, and wines, such as Kutjevacka Grasevina and Kutjevo Chardonnay, the Rhine Riesling of Enjingi, and also the Grasevinas of Krautheker and Zdjelarevic, Ilok Thaminer, Pinot Blanc from Pajzos and Endent Riesling from Belje are greatly appreciated the world over. Wines from the wine cellars of the Djakovo diocese, famous for the production of wines used in liturgical services, are equally well known.